The Electronic Entertainment Expo, better known as E3 or E3, is an annual game conference that has been held in Los Angeles, California; Atlanta, Georgia; and Santa Monica, California since 1995. In addition to their hardware and other series, Nintendo has showcased many new developments concerning the Super Smash Bros. series since 2001. 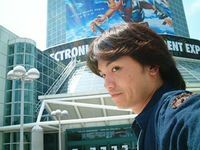 Masahiro Sakurai at E3 2001, outside the LA Convention Center. At E3 2001, Super Smash Bros. Melee was announced, complete with a trailer and playable demo. The trailer consisted of an early version of Melee's opening movie followed by a series of character demonstration shorts similar in execution to the Special Movie. Oddly, every time a character uses a grab in the trailer, they are shown to shield first, meaning that the actors are always using the shield+attack inputs instead of the grab button. While Sheik was revealed as a playable character, the trailer does not mention Zelda, and the demo did not allow Sheik to be played. As a result Zelda's playability was a secret at this time. At E3 2005, the Wii was unveiled as the Nintendo Revolution. Alongside a few other games, Super Smash Bros. Brawl was announced by Satoru Iwata, with no title or details given save for that it would feature online play. Sakurai was surprised at this announcement, since Iwata had not contacted him about development of the game. However, he later accepted Iwata's offer to become the game's director. At E3 2006, Super Smash Bros. Brawl was officially announced at the After-Hours Press Conference with a first trailer. This came as a bit of a shock, since traditionally all major games are unveiled in the main press conference. While it was known that collecting the Smash Ball would somehow unlock a super attack, the exact mechanics (attacking it until it breaks) were unreleased. While part of the Assist Trophy item, the Assist Trophy itself was never shown, and as a result the Nintendog was believed to be a separate item. It was widely believed that the massive fart unleashed by Wario at the trailer's false conclusion was to be a Final Smash. At E3 2007, a 15-second representation was shown to showcase the things already known about Brawl as distributed by the DOJO!!. However, the representation also accidentally showed Donkey Kong, who was unconfirmed by the DOJO!! at the time. Aside from lacking character voices, the footage appears identical to the game's released form. The first confirmed release date for Brawl for North America was announced to be December 3, 2007, but was later delayed twice. After much anticipation, a new Super Smash Bros. game was finally announced to be an upcoming title for both Nintendo's Wii U and 3DS systems. However, at the time of this conference, development on the game had not begun, and thus no further details were announced other than that the two games may be able to connect to each other. Super Smash Bros. 4 was revealed at E3 2013 during a Nintendo Direct presentation, in the form of a trailer. Demonstrations of the game were also made the same day, including the revealing of the Wii Fit Trainer and a battle between Mario and Mega Man . At E3 2014, a Super Smash Bros. Invitational held by Nintendo took place on June 10th, 2014 at 4:00 PM PTZ, where 16 selected smashers were invited to participate in a Super Smash Bros. for Wii U tournament. The winner of the tournament was Gonzalo "ZeRo" Barrios. The tournament also had several special guests, including an appearance by Masahiro Sakurai. During June 10th, 2014 at 9:00 AM PTZ, Nintendo released an E3 2014 video presentation in the form of a Digital Event. The video featured Reggie Fils-Aime (President and CEO of Nintendo of America) and Satoru Iwata (then-President and CEO of Nintendo Co., Ltd) in scenes of combat, culminating in a sequence that revealed Mii Fighter as a playable set of characters. amiibo figurines were also unveiled with proper terminology. Super Smash Bros. for Wii U was stated to be a pioneer, being the first Nintendo game to feature interaction with such figurines. At the end of the presentation, animated footage was shown of Link and Pit both engaged in battle, subsequently indicating Palutena's presence as a playable fighter in Super Smash Bros. 4. There was also a 90-minute developer discussion regarding Super Smash Bros. 4, including a segment hosted by Masahiro Sakurai that consisted of Pac-Man's revelation amidst the showcasing of other features. A trailer for Super Smash Bros. for Nintendo 3DS was also released during the event. Demonstration kiosks of both versions of the game were also available for use by event-goers of the public and press. Nintendo Treehouse also broadcasted live-streams throughout the duration of E3 2014, with many segments involving gameplay and discussion of both the Wii U and Nintendo 3DS iterations of Super Smash Bros. 4. The E3 event took place from June 16, 2015 to June 18, 2015. Nintendo announced on their Twitter account that Sakurai will be hosting a video presentation on June 14th, two days prior to the event itself. It announced the paid downloadable content which includes Lucas, Roy, and Capcom's Ryu as DLC fighters, as well as a returning 64 stage, Dream Land 64, and new Mii Fighter costumes. In addition, an update was released which added the Miiverse stage for free. All off this was available for purchase immediately after the presentation. It also teased at the return of the Hyrule Castle and Peach's Castle 64 stages some time in the future. In addition, the 2015 Nintendo World Championships featured Super Smash Bros. for Wii U as the fourth stage of the competition along with an exhibition match featuring Jigglypuff and Ryu in a Final Destination match with a special appearance by Hungrybox and Reggie Fils-Aimé. The Nintendo Direct: E3 2018 on June 12th (9:00 am PT / 12:00 pm ET) 2018 showcased the first look at Super Smash Bros. Ultimate for Nintendo Switch. All previously playable veterans were confirmed playable. In addition, Inklings, Daisy and Ridley were formally confirmed for the roster. New and returning items, stages and features were shown off as well. Additionally, Nintendo has announced that they would be holding an invitational tournament also on June 12th, featuring the new Super Smash Bros. title. New items include Healing Field, Black Hole, Launch Star and Fake Smash Ball. New Assist Trophies are showcased: Rodin, Squid Sisters, Bomberman, Burrowing Snagret and Sukapon. Returning Assist Trophies confirmed were Jeff, Knuckle Joe, Metroid, Ghosts, Lyn, Waluigi, Andross, Nintendog, Riki, Starfy and Midna. New Poké Ball Pokémon showcased Bewear and Solgaleo. It was confirmed that all previously released Super Smash Bros. series amiibo will compatible with Super Smash Bros. Ultimate. Playable characters who have an amiibo from other series will also be compatible as well. New amiibo for Inkling and Ridley were officially shown off in the Nintendo Treehouse segment. Nintendo also confirmed that the new amiibo for Daisy will be coming as well. This page was last edited on April 11, 2019, at 13:34.